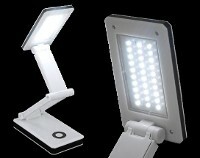 24 LED lamp with 12 LED lights per head. 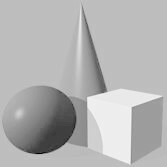 Moveable heads allow either a brighter light concentrated in one area, or the heads can divide to cover a larger area. Bendable arm is flexible to adjust to numerous directions. 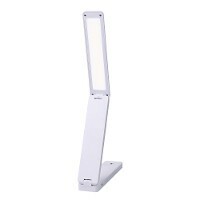 12” maximum height for large work area. Three levels of light: super bright, bright and normal. Uses four “AAA” batteries (not included). White color. Gift Box Carton: 5.5" x 8" x 5.25"
COB Worklight with base to hang on wall and magnet which allows 360° rotation to shine light in any direction. Four level switch: super bright, bright, flashing and off. White color. Light diameter is 2 ¾. Uses three “AAA” batteries (not included). Gift Box Carton: 3.5" X 2.75" X 3"
3 Watt COB light in folding book light or table lamp. Change between three levels of light: super bright, bright and normal by touching the sensor in the base. 7 ½” workspace. Folds down to 7” x 1” x 1 ½” for storage. White color. Uses 4 “AAA” batteries (not included). Gift Box Carton: 7.5" x 1.5" x 2.25"
Long lasting, super bright, battery operated with 30 LED desk light with two light levels. Good for home or travel. 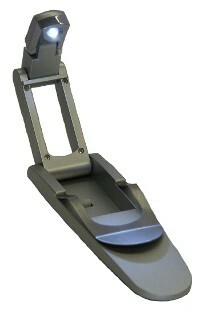 Head swivels to change angle for viewing. Unfolded is 9 1/2'' high. Folds up for storage and travel to 1 1/2'' high. Can adjust to any height between 9 1/2'' and 1 1/2''. White with black trim. Rubber pads on bottom. Uses 4 ''AAA'' batteries (not included). Food print 2 3/4'' wide and 5'' deep. Press a button and the book light will automatically open and turns on an LED light. Folds up for convenient storing or travelling. Clip onto book with metal clip. Operates on 3 button batteries (included). 16 LED lights for super bright illumination. Set on table, hang with hook or place on metal surface with Magnet for hands-free illumination. 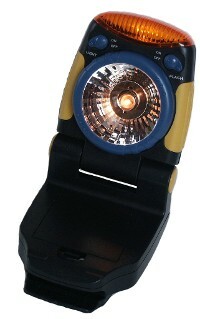 Also has handheld flashlight with 3 LED lights. Black color. 4'' X 2 1/4'' X 5/8''. Uses 3 ''AAA'' batteries (not included). 28 long lasting, low energy consumption LED flashlight makes this the perfect flashlight for emergencies or for everyday use. Metal construction. Carrying strap and grooved handle makes carrying and using the flashlight easy. Silver color. Measures 1 5/8'' diameter head, 1'' diameter handle and 5 1/2'' long. Uses 3 ''AAA'' batteries (not included). Bright light with 2'' reflector also has emergency flasher. Clip or magnet for hands free use. Ratchet hinge for setting correct angle. Uses 3 ''AA'' batteries (not included). 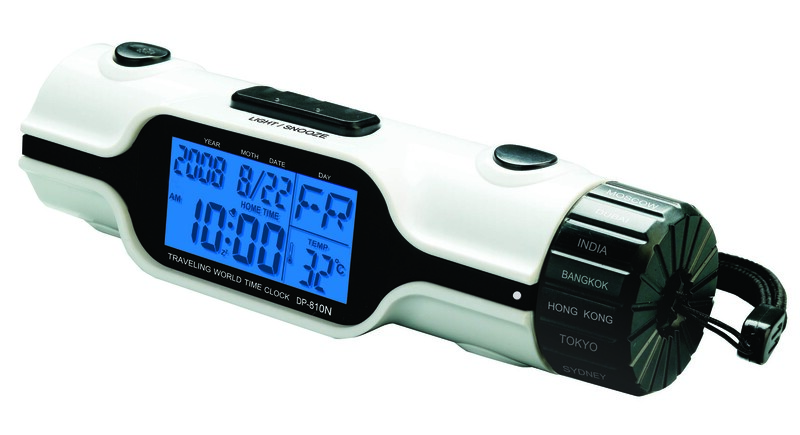 Plug in rechargeable flashlight AM/FM radio siren. Hold flashlight with 5 super bright LED lights or set the flashlight on table for 6 super bright LED lights. Fully charging flashlight radio allows for hours of use. Built in speaker. Charge by plugging flashlight radio into wall socket. Overload protection. Wrist strap.